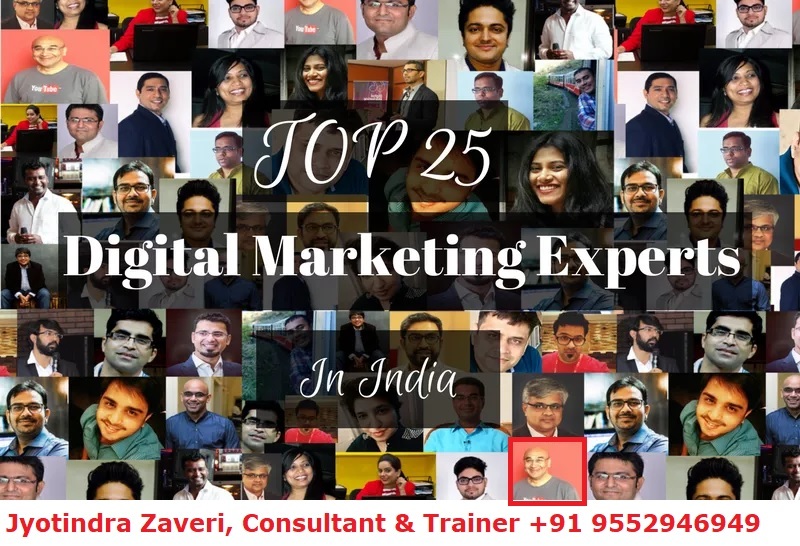 Here is a list of TOP Twenty-Five DIGITAL MARKETING EXPERTS IN INDIA, and I am feature in the same! The numbering is NOT FOR RANKING THE EXPERTS. See name 13. The demand for Digital Marketing is increasing. This in turn is increasing the demand of digital marketing professionals in India. The numbering is just for the sake of count, and NOT FOR RANKING THE EXPERTS. See name 13. • Jyotindra Zaveri is Social Media Marketing and ERP Consultant. He completed Electronics Engineering from VJTI Mumbai in 1975 and started his career as a Customer Engineer at IBM. • Jyoti has more than 42 years of experience in IT. He specializes in Social Media and ERP. He has travelled extensively from India: Bahrain, France, Germany, Italy, Japan, Malaysia, Netherlands, Singapore, Switzerland, Thailand, UAE, UK, and USA.